It's been a busy week, with not that much time for reading. 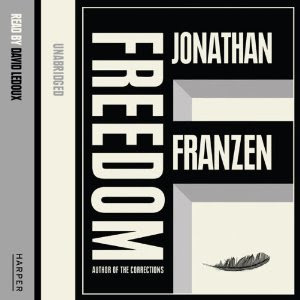 However, every night, sometimes all through the night if I haven't been able to sleep, I have been listening to my audiobook: Jonathan Franzen's Freedom. Looking through reviews of this book I see that people seem to either hate it or love it. So far, and I have almost finished it, I have loved it. I have heard it is a 'Great American Novel' for our times, and because American and British histories have been so much entwined during my lifetime, I have found that it is a novel that describes a lot of my life too. I certainly recognise the concerns and foibles of the characters. The book is called Freedom, and the place where this is most overtly mentioned is in the middle of the book where Joey, who has always thought of himself as a liberal-thinking Democrat without any sort of religion, finds himself re-assessing his stance. This new viewpoint liberates him; a freedom he acquires only because he is lucky enough to have another freedom: the freedom to choose. If this novel is a mirror held up to society then the image that Franzen sees may be distasteful in many of the details, but overall the view is good: in the land of the Free there is still the Freedom to choose happiness. 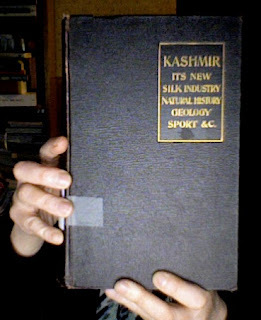 I love the structure of this book. The first section gives a short history of a family's life in a suburb, concentrating on the relationship between mother, Patty, and her son, Joey which rapidly turns acrimonious. The second section is Patty's autobiographical account of her life so far written at the request of a therapist, which is funny and gives fresh insight. The fortunes and histories of Joey, the husband, Victor, and the husband's best friend, Richard, are then revealed, and the history of the family moves on. By this time they have left the suburb and have spread around the eastern parts of the US to Washington, New York and the south. It even, at one stage, moves to Patagonia. It is a more affluent Patagonia than I ever encountered, but convincing all the same. 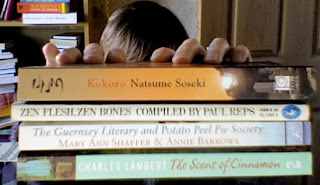 Apart from that I have a few more books on my reading pile I am anxious to read or finish: 'The Scent of Cinnamon' by Charles Lambert which is an anthology of short stories, the first of which is a fine ghost story, beautifully told. A friend has recommended that I read 'The Guernsey Literary and Potato Peel Pie Society' by Mary Ann Shaffer and Annie Barrows, 'Zen Flesh, Zen Bones' compiled by Paul Reps recommended to me by Hodmandod Senior, and then to continue my interest in reading the literature of the far east, I am going to read 'Kokoro' by Natsume Soseki - a Japanese masterpiece of the twentieth century. Never use the word "then" as a ­conjunction – we have "and" for this purpose. Substituting "then" is the lazy or tone-deaf writer's non-solution to the problem of too many "ands" on the page. The most purely autobiographical ­fiction requires pure invention. Nobody ever wrote a more auto­biographical story than "The Metamorphosis". It's doubtful that anyone with an internet connection at his workplace is writing good fiction (the TIME magazine cover story detailed how Franzen physically disables the Net portal on his writing laptop). My son, Hodmandod Major, at work (he is generating a high voltage using a Wimshurst machine). Plutarch was a Romanised Greek, and lived twenty miles from the temple of Apollo in Delphi (picture below) during the first century. He was educated in the Academy in Athens, initiated into the Mysteries of the god Apollo and he became a priest, responsible for the interpretation of prophecies of the priestesses. 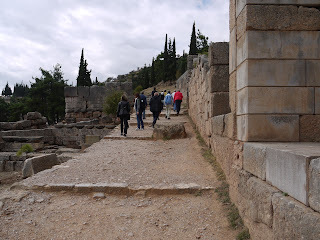 There is a Wikipedia article on the Pythia of the Apollo Shrine at Delphi which makes fascinating reading. At Delphi three tectonically active faults intercept. Movement along these cause the bituminous-rich limestones to grate together and become hot. The bitumin is then broken down to produce volatile hydrocarbons such as ethene. When this gas is concentrated in an enclosed place (e.g. the shrine beneath the temple at Delphi) it can cause hallucinations and trances, and at concentrations above 20% a kind of hysteria and fit. The remains of Apollo's Temple, Delphi. October 2010. One story behind the establishment of the shrine is that a goat fell down a fissure and had to be rescued by his herder. The herder and his goat climbed out in a daze - both had been intoxicated by a gas. This attracted other people to the fissure and eventually a shrine was built, and priestesses appointed. The priestesses (which could either be learned or ignorant) were local women who showed a shamanic tendency to go into trances and make predictions, and eventually a hierarchy of priestesses, priests and other helpers lived at the centre. Ownership of the shrine was important, as the predictions that the priestesses made were regarded with great reverence. 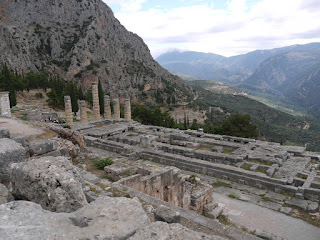 Athens, and other city states in Greece fought each other for possession of Delphi because with it went the right to skip the queue and have their prophecy revealed to them first. The last section of the Sacred Way, Delphi. October 2010. The supplicants would travel along a Sacred Way (the last section is shown above) to the temple, pay to have their fortune read, and a goat would be sacrificed. Before being killed, the goat would be sprayed with cold water, and if it shivered from the hoof up this would be deemed a good sign. Other good signs involved the state of the goat's liver. By this time the supplicants were in a psychologically vulnerable state. The Sacred Way was a long one, and they had frequently fasted and maybe gone without sleep (common ways of inducing a shamanic trance). By the time they heard the priestesses' (via the priests') utterances I expect they would be ready to believe anything. They then went back to their home states to report back to whoever had sent them. 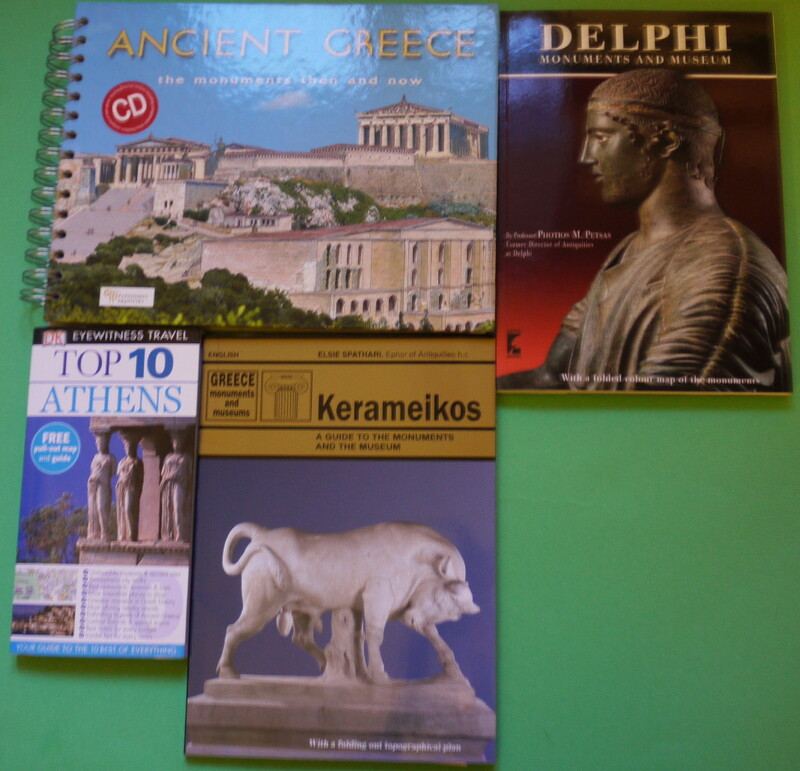 The importance of Delphi survived until Hadrian's time, but then it died away - perhaps because by then there had been few earthquakes in the region, and so the levels of gas had also become reduced. Plutarch's role of priest at Delphi clearly did not take a huge amount of time. When he wasn't at duty at the shrine he was entertaining visitors in his country estate or writing books like The Parallel Lives (which I downloaded on my Kindle). In this he took two great men - one Greek and one Roman - and compared their lives. He was not always accurate, but his accounts are entertaining because of the detail. I have just finished reading his account of Pericles, who was the man responsible for many of the Greek classic buildings around Athens (e.g. the Acropolis as below). 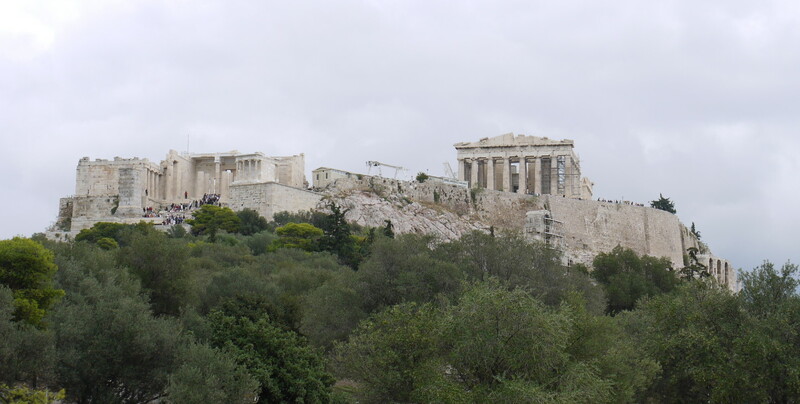 The Acropolis, Athens. October 2010. This is common knowledge, but Plutarch adds an extra detail which immediately fixes the man in my mind and makes him more interesting still. Pericles, apparently, had a large, out-of-proportion head, and this is why he is always shown in a helmet to disguise the malformation. So I look up images of Pericles on the internet, and find that yes, in each one Pericles is the one with the hat. 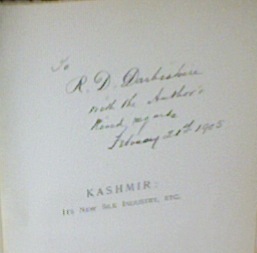 I am enjoying my book tour around the world. 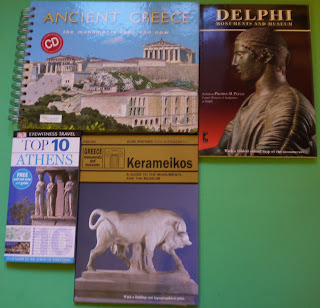 Having finished with Korea, I am moving back to Greece. I've already taken a look at the history a couple of months ago, which I knew very little about, and found it fascinating. Now I am going to revisit my trip there back in October, look through some of the many photos I took then, and thoroughly read the guide books. One thing that has struck me already is how similar Korea of 100 years ago (as described by Arnold Henry Savage Landor in Corea) was to Athens in the golden age (500BC). Both cities had walls, both were surrounded by mountains, the women of the upper classes led separate lives from the men, spent most of their days inside the house, and if they strayed outside on an errand had to keep themselves covered. His novel is a good one for learning about the mores of modern Korea: the ritual drinking, bowing, and general politeness of society are subtly evoked, as are some of the differences between North and South. My favourite parts were the slightly weird, unexpected things that were lightly commented upon: for example the friend that turned out to be imaginary, and the quiet studious girl who suddenly flashes at her boyfriend on-line (an image which is then sent around the entire school for all to appreciate). In the middle of the novel there are tracts that tell a lot about the philosophy of the place, and the end becomes an exciting spy story in a traditional sense. At the end there is a lot to muse over. I now going to read a few more of Young-Ha Kim's short stories, which are also on-line on the Authortrek page, then I think I shall move on from Korea to some place else. I continue to read about Korean etiquette, and it does seem quite worryingly complicated. As I read I wonder if some of this applied in China and how many people I insulted by sitting at the wrong time, eating a certain way, bowing insufficiently (in fact I can't remember bowing very much at all). The cultureshock book ends with an interesting resumé on Korean games including one called the 'Neolttwigi' or see-saw. I decided to see if there was a demonstration on Youtube and of course there was. It is traditionally a past time of women and a result of their being confined to the family compound: if they bounced high enough they were able to see over the wall. In Seoul, a hundred years ago, a small bell in the king's compound indicated that another, larger bell should sound. This in turn roused the gate keepers into action and, ignoring the crowd of people now hurrying towards the main gate, would shut it. No one was allowed in or out of the city after sun set. The streets also were in curfew for the times of darkness were the women's hours. While men were expected to stay indoors (except for about 5 nights of the year) the women were given the freedom of the streets. It was a freedom not frequently exercised with any relish because around the city of Seoul were mountains, and in the mountains were tigers, bears and leopards to whom the thirty feet city walls were no obstacle, and so they would prowl those streets empty of men, and sometimes dab a paw through a paper window and carry off a sleep-drugged resident from his furnace-heated floor and dismember him before bounding back to his lair with a full stomach. Arnold Henry Savage Landor spent several months in Seoul at the end of the nineteenth century, and although he claims to have no literary expertise he writes very movingly and interestingly about what he finds there in Land of the Morning Calm. One of the most poignant passages concerns an execution of several men convicted of conspiracy to commit treason. He details their parade around the streets on crosses on a cart, their eventual departure from the city through the Gate of the Dead and then the clumsy efforts of the drunk executioner to discharge his duty. Then he records how he encounters an old man accompanied by several terrified 'coolies'. They are terrified because the hills around Seoul, apart from being the refuge of carnivores also harbour spirits, and the ones emanating from freshly executed criminals were thought to be particularly malign and powerful. In vain the old man had tried to bribe them with strings of cash but they refused to go close. Arnold Lander took pity on him, and together they inspected the bodies and then the heads, and then, retrieving those that used to be the old man's son, risked punishment themselves to give the boy a decent burial. Mr. Lander, despite his modest protestations at the start of the book, is clearly a very good writer, and I suspect his artistry is impressive too. Throughout there are references to his drawings of the people and places that he sees, and the effect that his western art has on the royalty of 'Corea'. 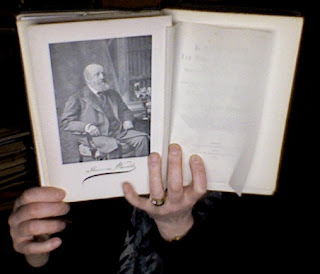 When he arranges for the prince to sit for him the young man comes four and a half hours early because he had been unable to sleep with excitement at the prospect, but unfortunately I cannot see them because the Kindle version does not contain the illustrations. If I were going to Seoul I would find this a fascinating introduction to the place - although I am sure it is now changed beyond recognition, and I would be left imagining how it was just as much as I am now imagining the content of Mr. Landor's pictures. At the moment I am fascinated by Korea. A few weeks ago I read 'Nothing to Envy' by Barbara Demick (downloaded onto my Kindle) which was about North Korea (reviewed here), and I read an anthology of short stories called 'Modern Korean Fiction' (reviewed here). Still not satiated, however, I have, over the last few days been reading Korea: A Walk Through the Land of Miracles by Simon Winchester. In 1988 Simon Winchester decided to retrace the 300 mile journey made by seventeenth century shipwrecked Dutch sailors from a honeymoon island in southern Korea to the border just about Seoul. Along the way he describes his encounters, the culture, the geography and the politics. He also delves a little into the language. Korean, surprisingly, is related not to Chinese but to languages like Finnish, Turkish and Mongolian (and, I guess, Estonian)*. For hundreds of years the Koreans tried to use the Chinese character system to write - but since the two languages are so dissimilar this proved to be too difficult for most people to master. So instead in 1420 King Sejong set a team of people on devising a new way of writing in Korean and came up with an alphabet which seems very similar to our own. It consists of 17 consonants and 11 vowels, and the shapes are supposed to resemble the shapes the tongue makes as it forms the sounds. It was easy to learn and use and resulted in the majority of the country becoming literate (this contrasts with what happened in China - for a long time only the scholars were literate because only they had time to learn how to write). The disadvantage of the system only became apparent during the age of the typewriter. Since the symbols were set in triplets - one before the first and then another set below those two - these were difficult to type. I expect the advent of the computer makes things much easier. This was just one of the topics that fascinated me while reading the book. Another was yet another idea of why the Chinese 'stopped' inventing sometime after the invention of the printing press a few hundred years before Gutenberg: according to the Koreans anything worthwhile doing would have been done already by the ancestors - Confucianism taken to an extreme - so there was no point in changing anything. Apart from learning a lot, I also found the book witty and very entertaining. The Simon Winchester of his latest books seems quite a serious sort of chap, but here he confesses to various enticements involving pretty young Korean girls. It is youthful, human and honest - and often made me laugh. This morning I have been smiling at another account of Korea which I downloaded on my Kindle yesterday. 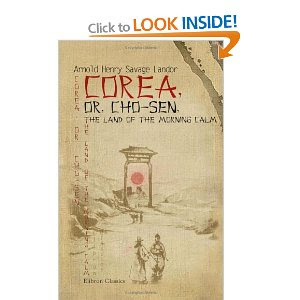 It is called Corea or Cho-sen: The Land of the Morning Calm by Henry Savage-Landor, dedicated to Queen Victoria and written in 1895. The Korea this depicts seems to come close to one of the lands visited by Gulliver. The people ride on ponies so tiny that have to have tall saddles so their feet don't reach the ground, and because this makes them somewhat unstable, have to ride supported by a servant each side and is led by an especially grumpy 'Puga' who leads the pony (and has the same outspoken opinions on the world at large as the average London cabbie). Now I am just reading about their currency of the time which is called 'cash'. Gold and silver were thought too valuable to be converted into coins because they might then leave the country. So, to preserve the nation's wealth, the money was restricted to bronze coins the size of the pre-decimal half penny with a square hole in the middle. These were then threaded onto a piece of cord in groups of a hundred, the cord knotted and then another hundred added. Since these bronze coins did not have much value many servants were required to carry the 'cash' around. I think this is all very wonderful and entrancing and am looking forward to reading more. To bring myself up-to-date I am also dipping into CultureShock Korea. This has a useful-looking quiz at the end which I couldn't resist having a quick look at and found I could answer the drinking etiquette question just from reading Simon Winchester's explanation of why exactly it is difficult to remain sober in Korean company. Next on the list are a couple of short stories by the Korean writer Young-Ha KIM (Whatever Happened to the Guy Stuck in the Elevator? and Photo Shop Murder), since I much enjoyed his Lizard story in the Modern Korean Fiction anthology. 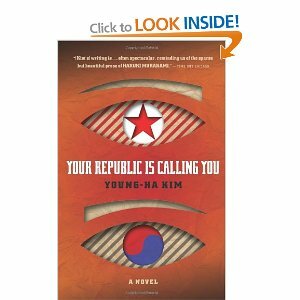 I have also ordered his novel 'Your Republic Is Calling You' because according to the excellent website on Korean fiction translated into English, Korean Modern Literature in Translation by Charles Montgomery (who was kind enough to comment on this blog), Young-Ha KIM as well as being an award-winning writer is also a funny one. * added later: apparently, since this book was written the altaic root (i.e the proto language thought to be the root of these languages) has been disputed, and most people regard Korean to be an 'isolate' like Basque. and once underneath his photo. I have written about Thomas Wardle before on this blog, and feel privileged to have something he owned in my hands. The library is something I use very often, of course. I find it an invaluable place because it is the source of such material as this, which would be impossible for me to know without it. Today there was a day in support of this institution of the library because it is under threat in this country due to the cuts and the advent of the computer and internet. But, as this article points out, the internet cannot replace the library, but merely complements it. There is much hidden away in vaults that would be completely inaccessible without the catalogue and the interlibrary loan. Places to work, study and consult are still needed - now more than ever.